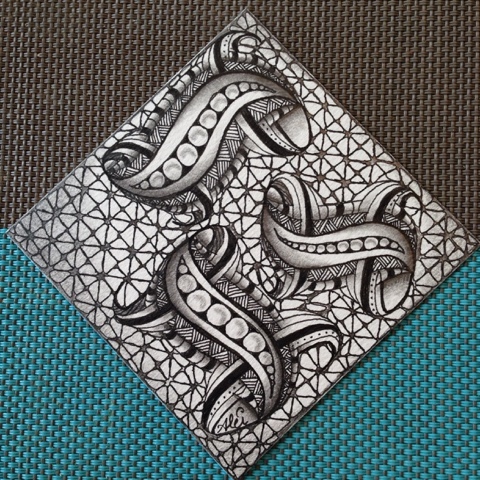 This week the "I am the Diva Challenge" #270 is to make a tile using the new pattern (by Margaret Bremner) Skye. 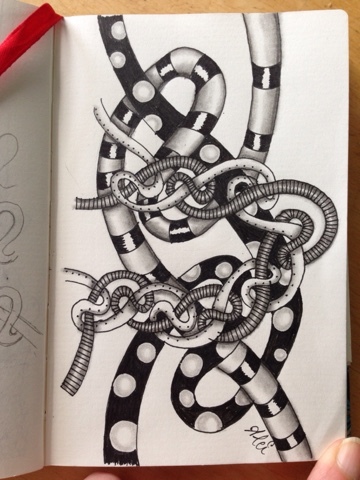 I started a zentangle already in my sketch book last week, but did not finish it. So, a good opportunity to finish it now. The pattern gives lots of possibilities and is very nice to shade. Here you can see my result. I also started to make a tile with the other new pattern that was posted last week: Ellish. Also a very nice and fluent pattern. This was last weeks Diva Challenge, but I post it here now. very nice and original Skye challenge!!! I also love your Ellish tile. Both of these tangles are not easy but you did a good job. groovy. I love how 3-d and shiny your skye tangle looks! Your Ellish is amazing. Mine simply wouldn't take flight, but yours are soaring! Excellent work. Love your tangled ropes of Skye!